Enter the personalization you would like, (ie., hanger color, wire color, ribbon color, name(s), etc.) Please see item description for details. Brides! Is your wedding Beauty & the Beast Themed? Then this listing is for you! 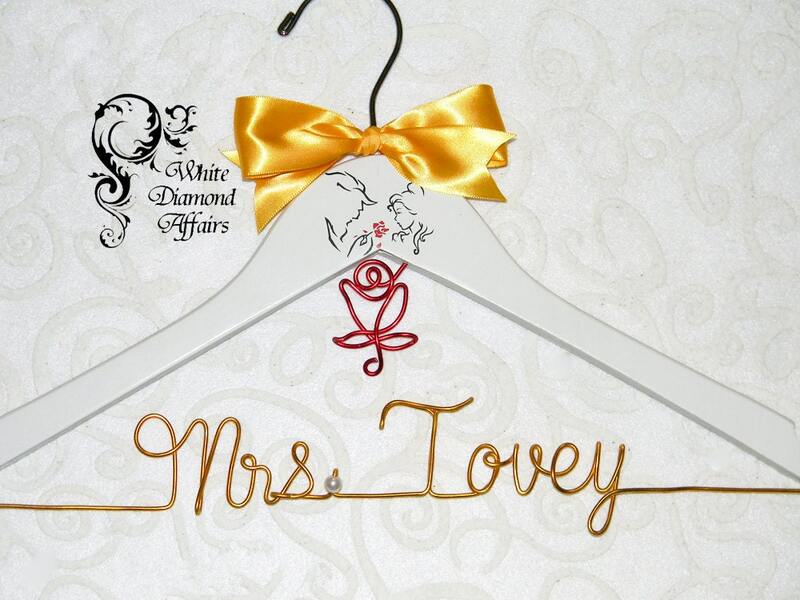 This is a Beauty & the Beast Themed Wedding Hanger that includes The Beast & Belle at the top, a red rose on the first line, and wire name personalization on the second line. 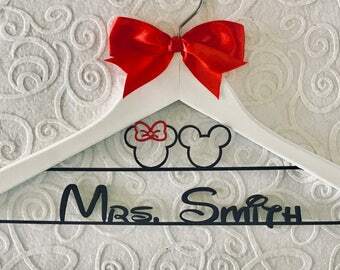 The vinyl decal at the top of the hanger will include Beauty & the Beast in black if your hanger is white or natural, or white if your hanger is dark or black to add to your fairytale wedding! This hanger is the perfect gift for the Bride-to-Be! She can hang her wedding dress on it so that the photographer can capture a great photo opportunity! Every hanger that White Diamond Affairs makes is handmade and is made to order once purchased. We allow a maximum of 14 characters. Anything else will make the letters smaller so they will fit. Capital letters count as two character spaces. Hanger is NOT recommended for storage of your gown. Please be careful when handling your hanger. Wire is very pliable to allow us to manipulate the personalization and could be bent out of shape if not properly handled. imperfections from the manufacturing process. Each hanger is approximately 17 inches wide, has notches for straps, and is strong enough to hold the weight of very heavy wedding dresses. Please view our store policies before purchasing. If you would like more than one please send us a message in the contact seller area and we will be happy to setup a reseved listing for you! If you want to order multiple items, we offer discounts! RUSH FEE: Add this item from our shop listings to your cart if needed within 14 days. We accept Credit Cards, Etsy Giftcards, and Paypal for order payment. international orders will be shipped with USPS Priority International Mail. Sale completion is an indication that you agree and accept our shop announcements and policies. Love it, great quality and came on time!